The system is corrupt and until there is a momentum of debate in Lebanon about how to wipe the slate clean and go for a new system entirely – probably one which does away with the confessional one – corruption will always run and control every single dime which is in circulation. It’s not only that an economy is held back from developing – as it frightens away foreign investors who would truly love to tap into the high level of education and location – but even security, law and order, the environment and public health are horrendously compromised as a result. The elite are fervently committed to allowing the ‘wasta’ (corruption by kinship) system prevail and law and order remain as a fanciful notion most Lebanese watch on American TV as it is a tacit deal between them and the masses which support them. Deeply unpopular moves, like, say installing law and order on the roads to curtain the daily carnage, would be deeply unpopular and be seen as a drain on people’s strained purses. Corruption works both ways. Bolton and Trump were obviously in full accord on recognizing Israeli sovereignty over the Golan Heights – a move that is certain to drive Syria and Iran closer to Moscow than ever and that can only motivate Damascus to poise new challenges for both Israel and the United States in retaliation as soon as possible. Brazilian President Jair Bolsonaro began a visit to the Zionist entity Sunday with a decision pending on fulfilling a promise to move his country’s embassy to occupied AL-Quds (Jerusalem), a policy change opposed by military officers in his cabinet. The four-day visit by the far-right leader comes a week before the Israeli’s closely contested election in which the right-wing Prime Minister Benjamin Netanyahu is battling a popular centrist candidate and corruption allegations, which he denies. A leading Israeli financial news website, Calcalist, reported on Sunday that Brazilian state-run oil firm Petrobras was considering bidding in a new tender to explore for oil and gas offshore occupied Palestine and a final decision would be announced during Bolsonaro’s visit. 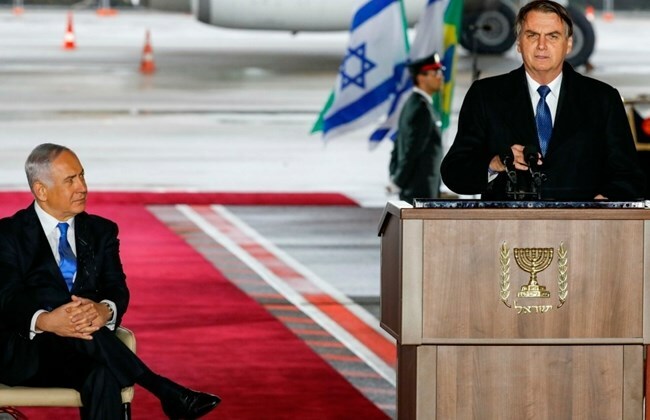 Visiting Brazil for the Jan. 1 presidential inauguration, Netanyahu said Bolsonaro had told him that moving the Brazilian embassy in Israel to occupied Jerusalem from Tel Aviv was a matter of “when, not if”. The US recognition of the Golan Heights as Israeli territory is another sign of the ongoing collapse of the establsihed system of international relations. The UN Disengagement Observer Force’s (UNDOF) mandate was renewed on December 21st, 2018 to June 30th, 2019.Thus, it’s peacekeeping operation in the Golan Heights continues despite the recent US move to recignize Israel’s sovereignty over this territory. The latest UNDOF report was published on February 28th, underlying that there are on-going issues of numerous violations of the Disengagement of Forces Agreement of 1974 and UNDOF’s ability to implement its mandate, including the deployment of appropriate technologies as recommended. The report covers a 90-day period between September 15th and November 20th. The report noted that the Israel Defense Forces (IDF) continued to fire across the ceasefire line and into the area of separation. UNDOF personnel also continued to observe crossings by unidentified individuals between Lebanon and the Bravo (Syrian) side and from the Bravo side to the Alpha (Israeli) side on a daily basis. The individuals crossing were usually described in the report as shepherds and farmers. The provided data confirms that Israel is the aggressive party in the situation and no misconduct was noted on Syria’s side. Thus, the UNDOF’s presence in the area appears to be more formal move than anything, since no peacekeeping is being established, the representatives hide in shelters and do not have any actual authority on-site. The US recognition of the Golan Heights as Israeli territory happened on March 25th, which is in the next 90-day period. So a report elaborating on the results of the action would be presented sometime in June, prior to the expiry of the UNDOF mandate on June 30th, 2019. The 1,000-strong force was dispatched to a buffer zone between Israel and Syria in 1974 to observe a ceasefire, and it is simply doing that – observing the breaches. It should be reminded that in the overwhelming number of cases Israel is the side that carries out any misconduct. In total, three UN resolutions call for Israel to withdraw from the occupied Golan Heights. Despite that, the US, the permenent UNSC member, said that the decision would bolster Israel’s security and “can contribute to the stability of the entire Middle East” by keeping Syria and its Iranian ally in check. The EU said they will continue to view the Golan as Israeli-occupied territory and will not follow in Trump’s footsteps. The US recognition of the Golan Heights creates a complicated situation in the UNSC as well, since a permanent member recognized it as Israeli territory, while all UN documents have referred to it as a Israeli-occupied territory since 1974. It is possible also that the US decision was announced at this moment, since the UN is undergoing deep reforms. It wouldn’t be surprising if it would receive a weaker response, simply due to the changes being introduced in the world body. At the same time, the decision is a stark reminder that international public law is collapsing, mostly due to US conduct, which is also paving the way for other countries to partake in such misconduct. One of the obvious examples of the US unanimously going against international law is the bombing of Yugoslavia. The UN and its Security Council managed to establish a somewhat peaceful zone in the Golan Heights, but the US decision threatens it profoundly. Syria had little chance of militarily returning its own territory despite the fact that it has all legal rights to do so. But now, that is questionable, despite Syria claiming that it is prepared to employ all necessary means to take its territory back. A military escalation in the area has also become more likely. This undermines efforts to de-escalate the Syrian conflict even further. The US already called for Syrian forces to withdrawl from the separation line, but is also unlikely to happen. For a long period of time, the Golan Heights situation was kept balanced by a large number of internationally recognized documents and mechanisms. However, now, these mechanisms seem to be de-fact destroyed. The US is, in essence, destroying one of the last standing “pillars of international law,” and is in fact creating a global situation in which the only means of settling conflicts is threat of military power and economic sanctions of individuals, businesses and government bodies. It’s interesting to note that the US action actually goies in contrary to the US’ won stance twards the Crimea issue. Russia officially, and mostly formally, condemned the US recognition of the Golan Heights as Israeli territory. However, in fact, Washington just created a precedent for Crimea to be recognized as an official part of Russia on the highest international level.